September 1978: a long time ago in a galaxy far, far away. In the 20 months since the last blog post, the Queen celebrated her Silver Jubilee and the Yorkshire Ripper repeatedly struck in Leeds, Bradford and Manchester. In the month The Ribos Operation was being written, Margaret Thatcher made some inflammatory comments about immigration that depressingly led to a massive opinion poll swing to the Conservative Party. But as far as Doctor Who is concerned, the most significant event was the UK release, in December 1977, of the worldwide hit Star Wars, which revitalised the whole genre of outer space sci-fi. The Ribos Operation opens with a scene that producer Graham Williams seems to have been planning since he got the job at the end of 1976. In it, the TARDIS is caught in blinding light as heavenly music swells, and the Doctor is summoned to meet the White Guardian, the embodiment (so he implies) of order and good in the cosmos. The White Guardian, who – as his name suggests – looks like a patriarchal British colonialist, tells the Doctor that the balance of the universe has been thrown off, and that the whole of reality is teetering on the brink of eternal chaos. The White Guardian then offers the Doctor a choice of either helping to restore the balance, or being condemned to eternal nothingness. Naturally, the Doctor reluctantly agrees to accept the White Guardian’s burden. He’s thus dispatched on a mission to reassemble the six scattered segments of the legendary Key to Time that binds the galaxy together and will allow the White Guardian to put a halt to the encroaching chaos. The first thing to note about all this is that Graham Williams conceived it at the very moment the fourth Doctor had finally won his freedom from UNIT and the Time Lords. That is, about one week after The Deadly Assassin was broadcast, Williams had already decided the idea of the Doctor as a free agent was not something he wanted to pursue. According to the info text on The Ribos Operation DVD, Williams found the idea that the Doctor had power without responsibility distasteful. So we get a scene that in some respects mirrors the end of The War Games, with a higher authority putting an end to the Doctor’s anarchic adventures, and giving him a mission to protect the interests of conservative forces. Given we’ve just seen the previous production team of Hinchcliffe and Holmes move in almost exactly the opposite direction, this is hard to see as anything other than a massive volte face. In some respects it’s easy to see why that might be the case: the story goes that the BBC brought Williams in specifically to curb the excesses of Hinchcliffe, which were starting to become politically inconvenient. The BBC Head of Serials instead instructed Williams to make the series more family friendly and avoid further complaints about its levels of violence and horror. So an uncharitable reading might be that Williams was himself on a mission to protect the interests of conservative forces. Certainly, he was dealt a pretty bad hand coming in as producer: the situation with scripts was pretty dire, especially after the cancellation of the planned The Witch Lords, while Hinchcliffe’s over-spend on his last two stories meant Doctor Who’s budget was comparatively lower for Season 15, and as a result, for the first time ever, a series looked cheaper than the one before. And because of the time he had to prepare the season, Williams didn’t even have chance to implement the creative changes he wanted to make. Let’s be charitable, then, and after the false start of Season 15 take The Ribos Operation as the real beginning of Graham Williams’ vision for Doctor Who. The opening scene sets out the stall – the Doctor is now an agent of the White Guardian, and he has a new purpose: to stop the spread of chaos. We’re then introduced to his new companion, a Time Lord called Romana. She’s looks and sounds a very different character from Leela: a well-groomed aristocrat, more qualified (at least on paper) than the Doctor, and with a nice line in withering put-downs. The Doctor and K9 are appalled. As a companion, she’s certainly a break from the past. She’s not even human, which means the TARDIS is now crewed by two immortal aliens and their robot dog that have no real need to ever visit the Earth unless they happen to have a specific reason to do so. This isn’t as much of a problem as it could be, given we’ve already seen that the Doctor is now pretty much the audience identification figure, and the companion is mainly there to clarify the plot. But it’s still a situation that would have been unthinkable at any previous point in the show’s history. Up to this point, the script has more or less been the work of Graham Williams and script editor Anthony Read. Robert Holmes’ script properly kicks in once we arrive on Ribos. He immediately introduces us to the first of three double acts around whom the story revolves. Garron and Unstoffe are working class con men, and they’re a classic pairing. Garron, the old timer, has his patter down to a tee. Unstoffe is young and a bit over-keen, with a tendency to go a bit too far in his conversations with the mark. That mark is the Graff Vynda-K, the deposed tyrant of a space empire, who forms the second double act with his loyal aide Sholakh. The Graff is dangerous because, like most of Holmes’ villains, he’s weak: short of money, and short of temper. Watch any episode of Hustle and the characters are almost exactly the same. The third double act is the Doctor and his young apprentice Romana. All three double acts work in the same way, they’re all outsiders visiting Ribos to try to steal something, and each has one smart but less experienced junior partner. The comedy arises from the way the three double acts mirror each other, or cross over (for example, Romana and Garron get a scene together in the catacombs, while the Doctor and the Graff lock horns) to the bemusement of the natives. The whole script is witty and clever, with funny little references to “the north” where the alien visitors all pretend to come from. 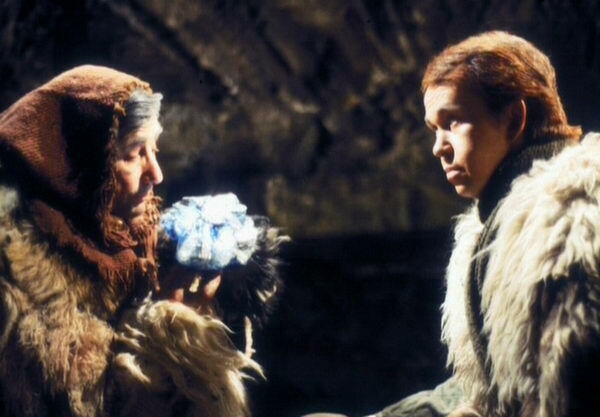 There are some farcical moments – like Unstoffe’s excruciating anecdote about “scringe stones” or the Doctor and Romana’s business in the jewel room – while the Graff’s florid villainy is amusing in its deliberate, scenery-chewing excess. Holmes wisely uses the Key to Time quest merely as a hook to get the Doctor and Romana involved in the story, rather than its main focus. The thing is, none of this is a million parsecs away from what George Lucas did with Star Wars. Given The Ribos Operation was written in January 1978, it’s the first Doctor Who script that was inevitably influenced by Star Wars from the outset. And the interesting thing about Star Wars is that for all it revolutionised special effects, the story was resolutely traditional, and told from the point of view of marginal characters like C-3PO and R2-D2, and full of double acts like the droids, roguish smugglers Han Solo and Chewbacca, and the teacher/pupil partnership of Obi-Wan and Luke. You can easily imagine Holmes being impressed not just by the effects, but by the skilful way Lucas suggested a far larger, lived-in universe than the one we actually see – references to the Clone Wars and the spice mines of Kessel were just tantalising hints that weren’t actually shown for another 20 years. The Ribos Operation similarly paints a picture of a backwater planet, like Tatooine, on the outskirts of a huge empire, whose people remain blissfully ignorant of the vast space war going on all around them. To an extent, Holmes has always been good at implying a bigger world than he can show, but from this story on he really focuses on doing it. And is it really a coincidence that the aristocratic Romana is dressed, like Princess Leia, all in white? You can also see why Graham Williams might have thought it would be a good idea to build a season around the galactic struggle between the light and dark sides. It’s hard to say whether the number of myth-inspired episodes during his tenure – Underworld, The Armageddon Factor, The Horns of Nimon – were a consequence of Star Wars’ appropriation of those archetypes, but regardless, something about them clearly appealed to Williams. It would be tough to argue that Star Wars wasn’t at the front of his mind when he was making Season 16. The Ribos Operation is Holmes’ least epic story. In fact, barring the opening scene, this is the most small-scale fourth Doctor adventure of all, with no ancient evils rising from the past, or threats to the entire galaxy. At the moment when Doctor Who is threatening to play at being a vast space saga, Holmes scales it right back. This is a self-deprecating masterpiece. Knowing that Doctor Who isn’t in the business of replicating Star Wars effects Holmes instead takes all the right lessons from its story: the juxtaposition of genres, the focus on people unwillingly caught up in vast events, the suggestion of a world that extends beyond the edge of the screen. The Force is strong with this one. Next Time: “The end of time will come at my hand. Free of time, and cause and effect, while creation itself ceases to be.” At the end of days we learn the name of the Doctor. It’s The Armageddon Factor.